A gay zookeeper from Oklahoma was indicted for allegedly trying to have an animal rights activist killed in a murder-for-hire plot. 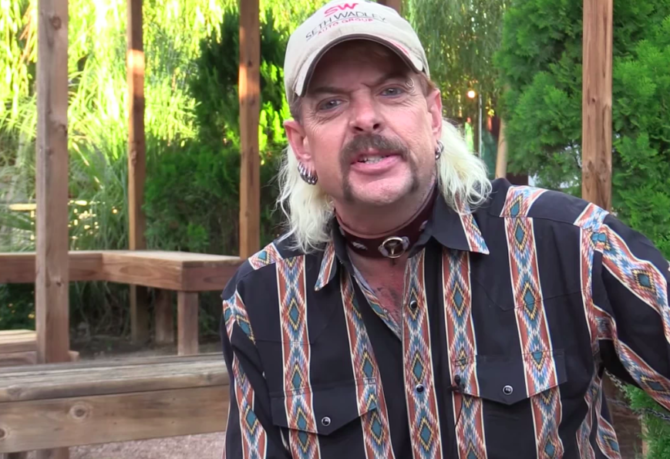 55-year-old Joseph Maldonado-Passage, who is perhaps better known as the moniker “Joe Exotic,” works at the Wynnewood Zoo in Wynnewood, Oklahoma. He’s also a vlogger, country music artist, and aspiring politician. His alleged intended victim is 57-year-old Carole Baskin, who owns and operates a large cat animal rescue in Tampa, Florida. On Friday, the Justice Department announced that Maldonado-Passage had been indicted by a grand jury on two counts of hiring a person to commit murder. Apparently, he and Baskin clashed for years over his treatment of large cats. In July 2016, Maldonado-Passage offered a hitman $3,000 to travel from Oklahoma to Florida to murder Baskin. Then in November 2017, Maldonado-Passage tried again. He set out to find another hitman. Unfortunately for him, instead of locating a legit murderer, he connected with an undercover FBI agent, and his plot was foiled. “He’s been threatening me for many, many years,” Baskin tells The Oklahoman. It’s unclear whether he was referring to Baskin. Maldonado-Passage was arrested in Gulf Breeze, Florida on Friday. He now faces up to 20 years in prison and $500,000 in fines. Ok someone needs to say this……………………What the f*ck is going on in Oklahoma? And if they didn’t say he was a gay zookeeper, y’all would be complaining about “what does this have to do with gay people?” Damn, Queerty can never get it right for you people. @Startenout. That is sooooo true!!!!! startenout: I agree. the audience is so fickle. queerty is doing nothing to help forward human rights…. His first red flag something wasn’t up was a stranger being a-ok with killing someone for only $3,000. Then again I’m not exactly up on the hired hit man pay scale these days.